Anyone who knows me knows I don’t iron. I don’t walk about with all my clothes and my family’s clothes looking like they have been dragged through a hedge backwards, no, my husband irons or my mother irons when she watches the children. She has to keep busy, she says. I tend to burn myself with the iron, no idea how, but since then, no-one lets me iron. Win for me. However, went I was sent a snazzy new iron from Morphy Richards who promised my “Effortless Ironing” I just had to try it out. 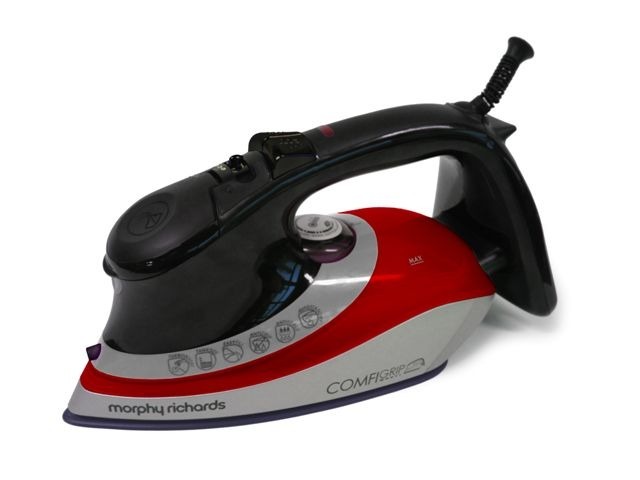 This iron has an ionic soleplate, which is Morphy Richards idea for effortless ironing. They have launched its new soleplate technology into two of it’s existing ranges. 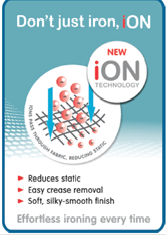 The new technology reduces static in your garments by using negative charged ions which pass through the fabric. Having a dual steam function, a steam boost in the tip of the soleplate allows it to reach those hard to reach and stubborn creases, and a constant steam from the main body of the soleplate for normal ironing. Ok so ironing isn’t fun and those who say it is, clearly you drink wine with it. Seriously, the iron didn’t make me love ironing, but I didn’t hate it. It was easy; it glided effortlessly over the clothes, making the ironing quick and efficient. No more spending hours going over and over those shirt sleeves, once over and it’s done. Leaving nothing behind but silky-smooth clothes, I was impressed. I didn’t burn myself so it was a plus. After using this very cool iron, I will be ironing again, but shhhh don’t tell my husband or mother. I might let them use it, or just keep it between me and the Morphy Richards Comfigrip Steam Iron. Disclaimer:- I was sent the above items as stated in the post. I’ve reimbursed for this post, for further information see my disclosure page, but all words and opinions are my own and the links have been included out of courtesy.